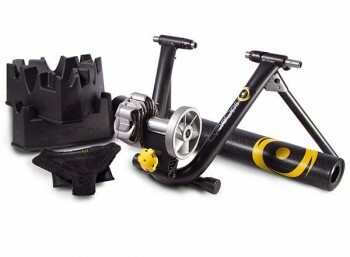 The CycleOps Fluid 2 Training Kit is the exact same turbo trainer as the standard Cycleops Fluid 2. However, the Training Kit includes several accessories that improve you home training. 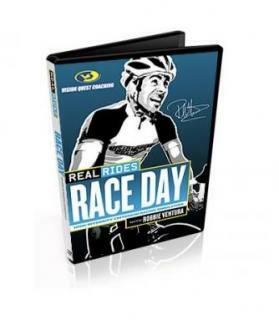 Included as part of this package are 2 x front wheel riser blocks, a bike thong (for stopping sweat dripping on your bike), a training mat, and a RealRides Race Day DVD. 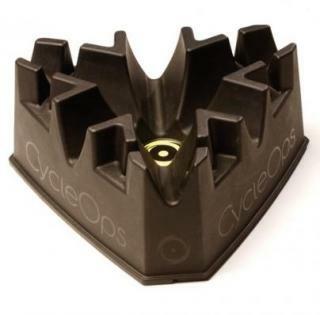 Riser blocks serve 2 main purposes, one is to hold your front wheel steady, and the other is to raise the front wheel of your bike so that you are cycling at a more realistic position. The inclusion of 2 riser blocks means you have the option to workout with an upwards incline, adding more difficultly for when you want to push yourself and get out of the saddle. When you workout indoors you do not have the wind in your face and it can get very hot. This means you sweat more than normal, and the included bike thong catches most of the sweat and keeps your bike dry and clean, and also your floor. The supplied training mat provides a surface for the trainer to sit on, protecting your floor and also reducing vibration noises during a workout. Also the mat stops sweat dropping on your floor. The RealRides Power Indoor Trainer DVD provides an 8 week workout program aimed at increasing power and endurance. There is 75+ minutes of interval training with on-screen displays and tests to measure performance. The turbo trainer itself uses a fluid brake that offers progressive resistance. This means that the resistance is directly proportional to the speed at which you pedal and the gear your bike is in. However, the power to pedaling speed ratio of the Fluid 2 is specially engineered to mimic real life cycling conditions, meaning you get a very realistic workout. Also, the Fluid 2 is a very quiet trainer, which is perfect for indoor use. You can read more about the CycleOps Fluid 2 here.